Anyone who follows MMA intently knows that the sport’s upper echelon has been invaded by a “new wave” of fighters, who are making their presence felt, despite the fact many of them are barely past 20. Unlike previous generations of fighters, many of these competitors have been training in all aspects of MMA since they were teenagers, and in some cases, even before that. They have spent much of their lives dreaming about, and preparing for a career as a MMA fighter. In the grand scheme of things, it’s a mindset and vision that didn’t exist until recent history. One of these “next generation” fighters is American Top Team’s Justin Scoggins, who made his UFC debut this past December at the age of 21. 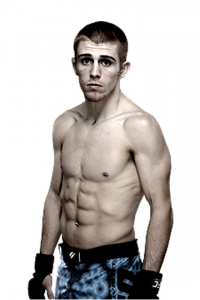 Having scored a first round, stoppage win over Richie Vaculik at UFC FN 33, the UFC booked Scoggins to fight veteran Will Campuzano at UFC 171 this Saturday. The “Tank’s” near lifelong dream is clearly well underway. After taking his first steps into a life of competition as a toddler, Scoggins continued to train until he made his amateur MMA debut in 2010, and his pro debut in 2012. To date, not only has Scoggins won all eight of his pro bouts, but the flyweight has scored a TKO or knockout in six of them. Despite the fact the American Top Team fighter had less than ten fights on his record as 2013 came to a close, the UFC was clearly convinced of his ability to compete at the sport’s highest levels. UFC 171 will be hosted by the American Airlines Arena in Dallas, Texas, and will feature Johny Hendricks taking on Robbie Lawler for the vacant welterweight title. 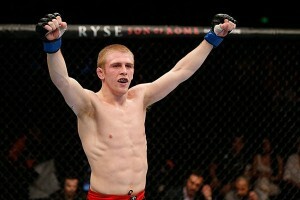 Stay tuned to Full Contact Fighter for a follow up article with Scoggins, regarding his thoughts on Campuzano and training with American Top Team.